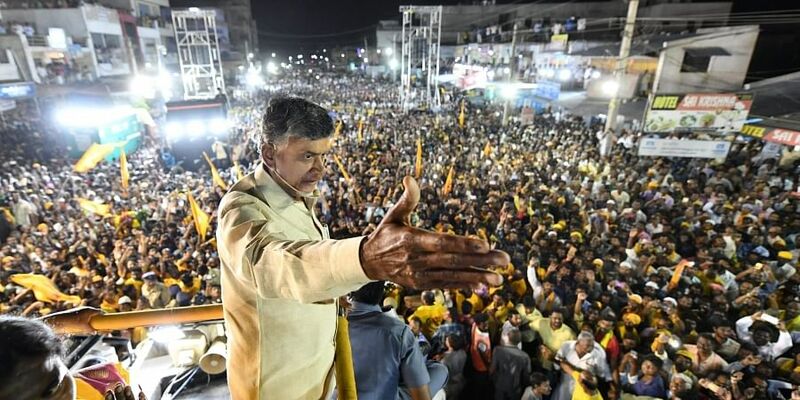 Addressing a large public gathering in Puthalapattu, hours after Narendra Modi spoke at an election rally in Rajamahendravaram on Monday, Naidu refuted Modi’s allegations point-by-point. VIJAYAWADA: In a vehement rebuttal of Prime Minister Narendra Modi’s allegations against him and his government, Chief Minister N Chandrababu Naidu said the PM was acting in a manner that was unbecoming of his high office. “At the click of a button, water will reach villages. I will ensure water security and develop water grid like power grid to ensure 24x7 water supply,” the TDP chief asserted. Describing Modi as a betrayer of Andhra Pradesh for ‘failing’ to keep his promise made at the feet of Lord Venkateswara to give Special Status to the State, he demanded to know with what face Modi came to Andhra Pradesh. Finding fault with the Prime Minister for commenting on him, his son and family, Naidu hit back: “At least we live with our family. Husband and wife stay together. What about you?” He advised Modi not to act in a manner that did not behove of his high office. He also faulted Modi’s remarks against Heritage and said the company was the result of his wife’s ‘unblemished’ hard work for 27 years. Even former AP Chief Minister Y S Rajasekhara Reddy failed to prove his allegations against the firm, he claimed. Taking exception to be branded a ‘U-turn’ man, Naidu said, “I always take right turn not U-turn.” “It’ Modi who took U-turn on Special Status and betrayed Andhra. All I did was to oppose his wrongdoings.” Describing demonetisation as ‘Tughlaq act’, he said it was done with an eye on elections. Calling Modi his junior in politics, Naidu said he had nothing to learn from the PM about development. Pulivendula. Like GST, here JST (Jagan Service Tax) is being collected,” he alleged. Naidu said it was SV Satish Reddy, though being rejected by Pulivendula voters for 20 years, strived to get water for the constituency not Jagan Mohan Rddy or his family members, who were being supported by people for the last four decades. “As promised, I brought water to Pulivendula before my Kuppam. Vote for Satish Reddy and Adinarayana Reddy, I will ensure water supply for every acre in Pulivendula,” he said while promising to provide a global market for horticulture produce from Pulivendula by creating necessary infrastructure, including cold storage units, and eliminating middleman. Pointing out at complaints against pollution from uranium mines, the TDP chief said YSR brought ‘projects’ that threatened lives of the people, while he brought projects that helped improve people’s living standards. In Jammalamadugu, quoting Mahabharat, he said a criminal and liar had no right to rule. Describing Jagan as a criminal, Naidu said the YSRC chief would pledge the interest of the State for his own political and personal gains. “In the name of Brahmani steel, they looted iron ore from Jammalamadugu and are now facing cases. We will not do such things. We will set up a steel plant and I have already laid the foundation stone for it,” he asserted. Even before they engaged in a verbal duel during election rallies, Modi and Naidu locked horns on social media platform - Twitter. Modi tweeted in Telugu - that he is addressing an election rally in Rajahmundry, his second visit to AP after election notification. He said he believes TDP will suffer defeat as people do not want a corrupt family rule. Responding to the tweet, Naidu asked Modi what happened to promises of SCS, world-class capital, bringing back black money? Today seeing you, who has a truck with the criminals, speaking about corruption, it looks ugly. People are interested in dethroning your government, which made a mockery of democracy.